1. You run out of money before you run out of month - It seems that there is always something that needs to be paid for today, but payday is next week. 2. Kids are expensive - There's all the basics like clothing, books, toys and school supplies, and then there's the extras...sports, dance, music lessons and all of the uniforms/costumes, fees and travel that go along with those. Even the simplest of activities can put a strain on any families budget. 3. Your car could use an upgrade - Is your car always in the repair shop? Need more trunk space or more seats? Need a car with air conditioning? Is your car older than you are? Does it only get 10 miles to the gallon? Getting a new car, or just keeping your current one on the road can put a dent in any budget. 4. Your home needs repairs or improvement - Leaky faucet, new roof, your living room looks like something out of an 90s sitcom...there's always something that we want to "fix" in our homes and often not enough money to do it. 5. You need a vacation - When was the last time you took a trip for fun? Either your job doesn't give vacation time or you can't afford to go anywhere when you do get time off. 6. You don't enjoy your job - Working just to pay the bills? Working on their schedule, not your own? Putting in too many hours for too little reward? 7. Not enough time with your Family - Need more flexibility in your schedule to do the things that really matter to you, like caring for and spending time with your family. Start your own business for as little as $25 - With our Basic Starter Kit you get the tools you need to get your business started; brochures, samples, 4 full size products to use yourself or sell for 100% profit. You can choose to add one of two deluxe kits to fit your personal business goals and needs. You can also choose the Advanced Starter Kit for $50 or the Premium Starter Kit for $100 for even more samples and full size products. Free online store - Share your online store and customers can place their orders to be delivered to them anywhere in the US. Your face to face customer can even use the website and place their order to be delivered by you. 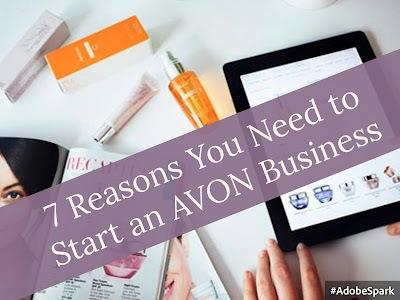 Training and Coaching - Your Avon website and Avon University offers a wide selection of training courses, live webinars and tools for Representatives. When you join our team, you'll also receive one on one coaching from and experienced representative. Thousands of high quality, affordable products - Our brochures and website feature some of the world's most popular and recognizable skincare and cosmetic brands as well as a variety of fashion, jewelry and products for home and family. Only $50 minimum order required to earn commission - Representatives earn 20-50% on personal sales. And New Representatives have exclusive incentives during their first 12 Campaigns (aprox. 6 Months) to help them earn more as they are building their business. Click here for Details of the current incentive. Work your business on your time in your way - You set your own schedule and decide how you want to work your business. Take orders when, where and how you want. No parties or inventory required. Make a difference in the lives of others - Help others build a business and change their lives and earn bonuses for doing it.